Rafi Bywater is unlike anyone else. The people in his village don’t trust him because he spends too much time in an abandoned dragon lair. When a stranger, Mister Flitch, accuses Rafi of being “dragon-touched,” Rafi sets off to discover the truth about dragons—and about himself. On his journey, Rafi befriends a brilliant scientist, Maud, who has secrets of her own. Together they search for dragons while escaping from a dangerous dragon hunter, engaging in a steam-engine car chase, and figuring out what Mister Flitch really wants with Rafi. And, oh yes, they do find the dragons. Sarah Prineas delivers a sweeping adventure filled with glorious dragons of all kinds! DRAGONFELL is a fun middle grade that addresses being different and not fitting in easily in the context of a fantasy with dragons. Rafi has always been a little different. He has trouble in school not being able to read, and his appearance is odd enough that the villagers are never quite sure of him. When some new people show up in town, they declare that Rafi is dragon-touched and must come with them. Rafi does not want to go with them, and instead, strikes out on his own to find the truth of the matter. As coal-powered factories are becoming more common in cities, dragons have been disappearing. On his journey, he meets the tenacious Maud, a dragon scientist who is determined to study them. Together, and accompanied by a herd of goats that follow Rafi, they must uncover what is happening to the dragons, as well as Rafi’s own identity. What I loved: The message here is fantastic- being different can be a good thing, and it doesn’t make you any less than anyone else. Rafi is a sympathetic character and he’s a great lead as he sets out to discover who he really is. Maud is also fantastic, a female scientist who is very clever and bold. Combined, they make for an unbeatable duo. The mystery lying under the surface about the dragons is also a fun theme that makes the pages turn quickly. What left me wanting more: As a small point, the villain (Mister Flitch) was a bit cartoonish at times, and it was unclear what motivated him beyond the abstract idea of power. I think it would have been interesting to make him more multi-dimensional, but this is a middle grade, so the story remains simpler this way. Final thoughts: Overall, this is a fun and fast-paced middle grade fantasy which keeps the pages turning quickly. Presenting being different with dragons is a really great way to address a relatively common concern among this age group. 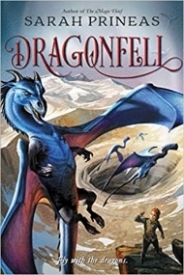 Recommended for audiences who love dragons and fantasy novels across a broad age range.